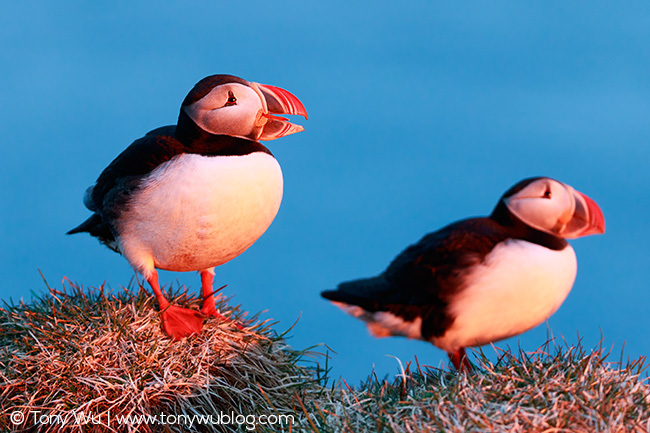 Puffins have been on my want-to-see list for a long time. In my mind’s eye, I pictured these marine birds as small, clumsy (on land at least), and entertaining. Turns out, I was right. 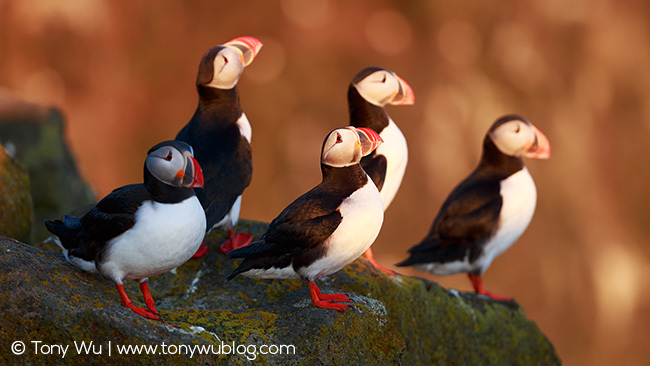 I recently had the pleasure of spending just over two days with these comical characters while I was in Iceland with my friend Jon Cornforth. We spent a couple of weeks driving around the country, primarily chasing light to look for landscape photo opportunities. Jon had been to Iceland a couple of times in the past, so he knew his way around. He was kind enough to offer to take me to see some puffins (translation: I pestered him until taking me to peer at puffins was the least painful option for him). 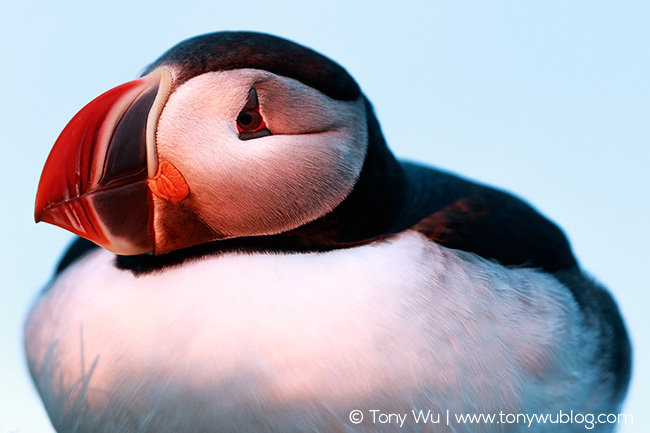 There are three species of puffins, the one in Iceland being the Atlantic puffin (Fratercula arctica). This species is, in my opinion, the cutest among the three. It was early June when we visited, early in the summer, and therefore early in the birds’ nesting season. There were no chicks, none that we could see at least, but we did see many birds engaged in what appeared to be nest-building activity. 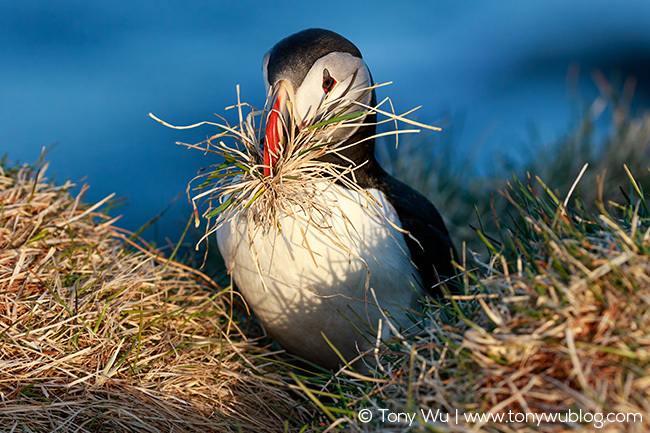 Puffins appeared from their burrows from time-to-time, plodded around a bit, grabbed mouthfuls of grass, then disappeared back into their homes. Sometimes, the grass proved to be stubborn and wouldn’t break free. 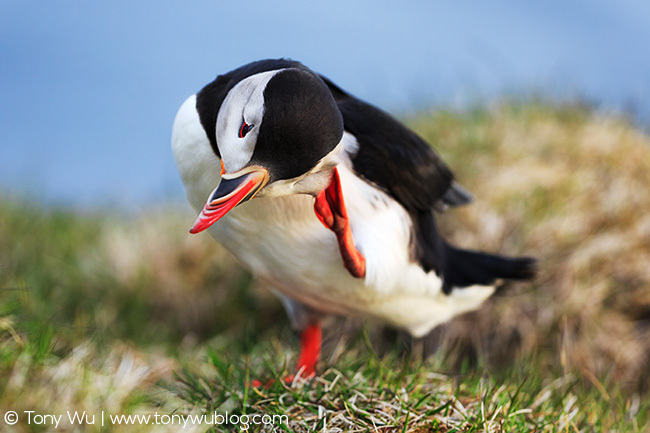 Instead of moving on to tug at a different patch of grass, puffins would often double-down on their chosen greenery. They’d brace both bright-red feet against the turf and yank with all their might, tugging one way, then another, pulling with every little fiber of their dorky-yet-adorable bodies. Most times, this monumental test of avian will resulted in the desired outcome, producing a mouthful of prime nesting fodder. On more than one occasion though, we watched as a bird lost its grip and tumbled backward from its own momentum, recovering moments later to look around with a half-dazed expression of: “You didn’t see that. Nope. You didn’t see that.” One fell off the cliff. The laughs didn’t stop there though. 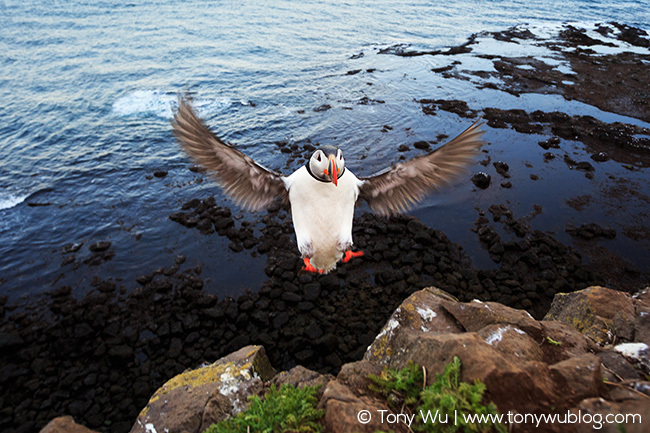 Puffins are not graceful flyers. They are, if anything, awkward, but (mostly) competent. Proof of this came in the form of sound. While lying on the ground eye-to-eye with a few birds, Jon and I heard a loud noise, somewhat of a cross between a Plop! and and a Thud!, a Thlop! perhaps. 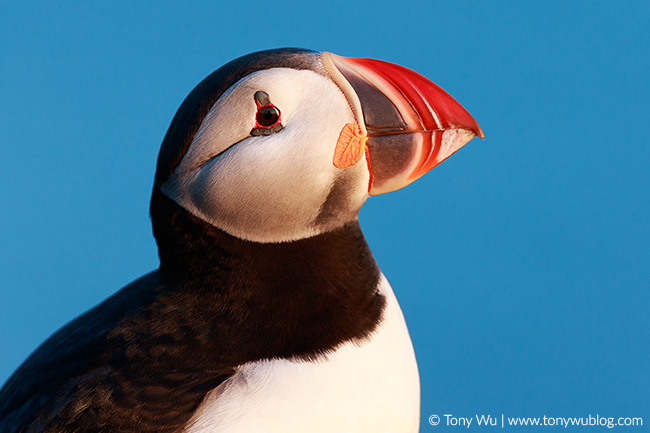 The cause wasn’t immediately obvious, until we noticed it again when we spied a puffin returning from sea. In hindsight, I am quite certain that said bird fully intended to make landfall next to us with as much savoir faire as is plausible for a puffin. That didn’t happen though. 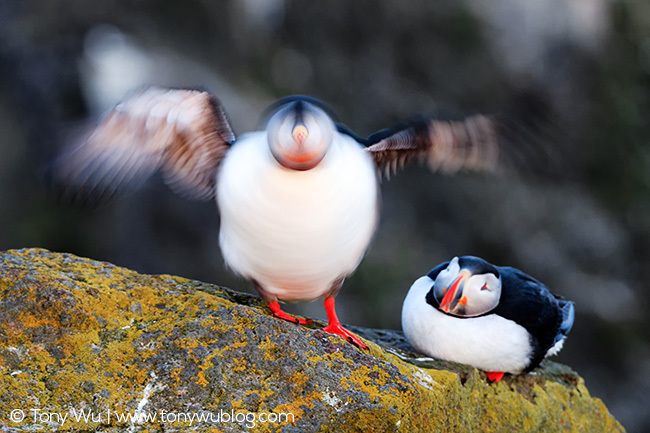 The bird smacked belly-first into the side of the cliff, tumbling as gravity took hold, flapping frantically to regain aerial composure and make another landing attempt. Thus was the mystery of the Thlop! solved. 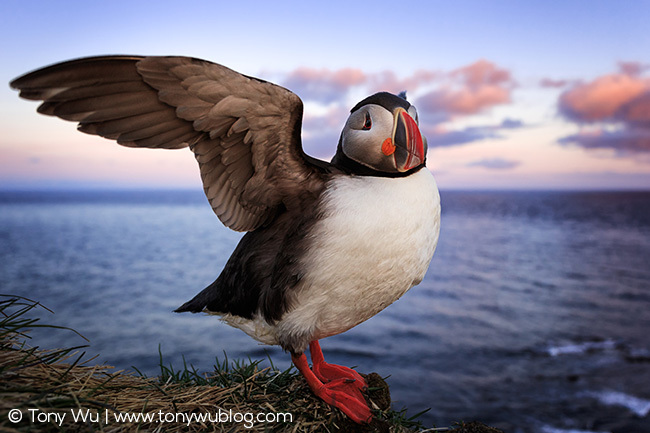 As you may have surmised, I thoroughly enjoyed my puffin experience. 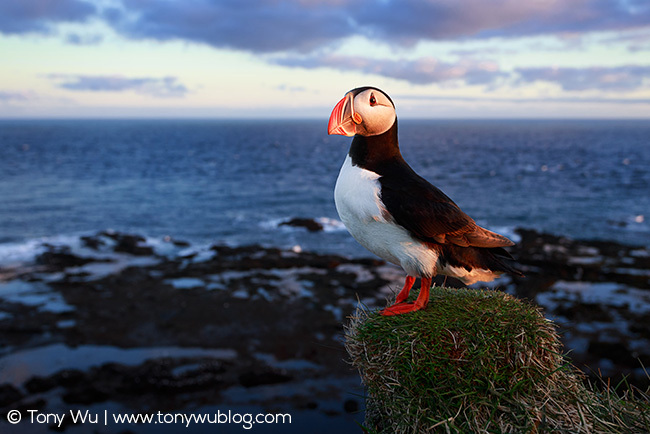 If you ever have a chance to sit down with puffins, do it. They are pure feathered comedy, good for the soul. 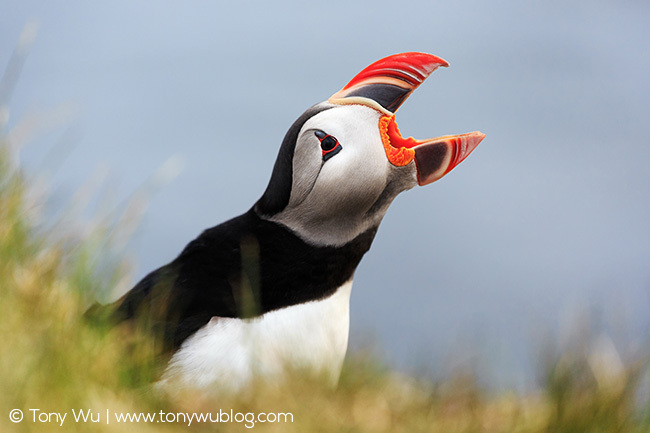 On a serious note though, I learned shortly after I got back that Atlantic puffins have just been added to the European Red List as a bird species that is under threat. 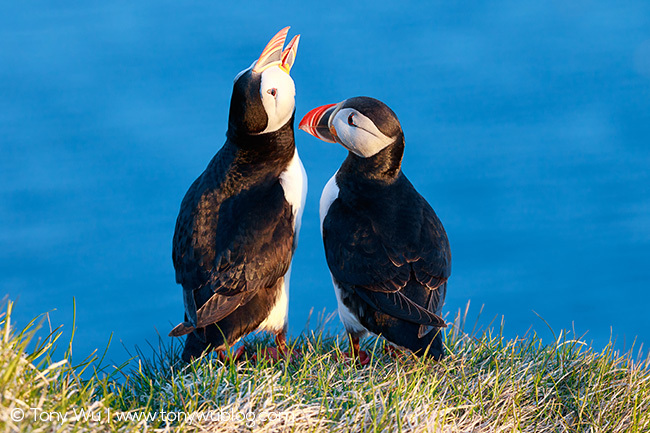 Though there are many puffins in the North Atlantic, some populations seem not to have produced chicks in recent years. The implication if this continues is obvious. 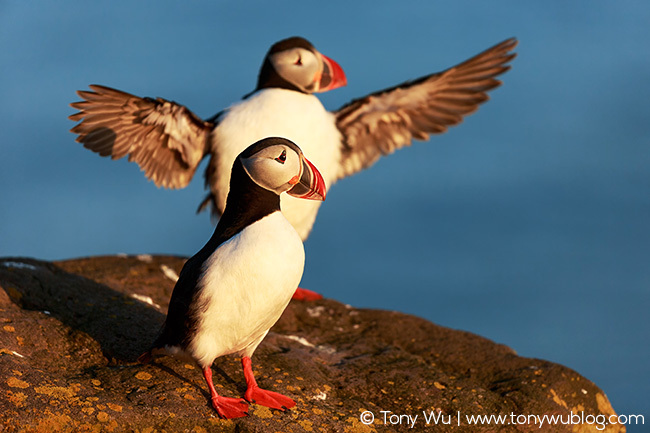 If you’re interested in learning more, the Royal Society for the Protection of Birds has posted a podcast discussing this issue. Click over to this link to listen.